There are many great trees that grow in the United States. Oaks are certainly among the best. Some are better in the north, some in the south. Some are better in acid soils and some like or can tolerate alkaline soils. Some will grow in almost any of the conditions. Here’s a quick rundown of the choices that might help with your selection decisions. All these short descriptions are linked to longer entries in our site’s Library. A small growing bushy tree to 15 feet. It has pale flaky bark, orange fall color and very interesting crooked branching. Grows well in most soils but prefers well-drained alkaline soils. Zones 7-9. Large deciduous tree closely kin and very similar to red oak (Q. rubra). Height 70 – 90 feet with an irregular crown and limby top. Its spread is 50 ft. or greater. Prefers acid soils. Zones 3-9. Rounded, symmetrical, deciduous shade tree with height of 50 to 60 feet, spread of 30 to 40 feet. Thick, club-like leaves and very dark heavily textured bark. Stiff in overall appearance. Zones 5-9. Large rough-textured, deciduous shade tree. Height 60 to 80 feet, spread 60 to 80 feet. It’s a stately, tall, rounded, tree with huge leaves and golf ball size acorns. Yellow fall color is so-so at best. Zones 3-8 in most all soils. A semi-evergreen red oak that naturally grows in a pyramidal shape while it is young, developing a broader canopy with age. Red or yellow fall color can last all winter. Grows to 60 feet tall, it is good oak tree for the medium sized landscape and can grow in any soils (unless crossbred with pin oak) throughout zones 7-9. Escarpment live oak seems to be more drought tolerant and cold hearty than southern live oak. Both live oaks lose their foliage in the spring when the swelling buds push them off. New leaves emerge quickly and everyone calms down again. Winter color of the foliage ranges from bronze to reddish purple. Tolerates most soil in zones 7-9. Graceful, deciduous shade tree. Height 70 to 90 feet, spread 70 to 80 feet. This oak is a large-growing, dramatic tree with true chinquapin-type leaves, large acorns and a light gray flaky bark. Fall color is yellowish brown and not spectacular. Dramatic open branching and light colored bark. Use in any soils in zones 5-8 in the central and south central U.S. Wide, dramatic, evergreen shade tree with large limbs that tend to dip and sweep to the ground. Some limbs actually rest on the ground. This great tree is actually too large growing for most residential property. It is pH adaptable and tolerant of drought and poor soils, although it does not tolerate poorly drained soils or extremely well-drained deep sand. Its small, leathery gray-green leaves are evergreen except in the northern part of its range (zone 7a), where it becomes semi-evergreen. Its primary liability is its susceptibility to the oak wilt fungus, although it hasn't hit Q. virginiana as severely as Escarpment live oak, Q. fusiformis. Any soil in zones 7-9. Tall, rather irregularly shaped tree. It has open branching, smallish leaves with rounded lobes and yellow to reddish fall color. Sometimes confused with the much shorter growing bigelow oak that grows in the rocky limestone soils. Zones 7-9. Native to three different continents, English oak is a stately tree best known for being part of the forests and landscapes of England. There are several specimens of this tree in the Fort Worth Botanical Gardens. It is a large species that is commonly found in public settings like parks, though it can certainly be grown in larger home gardens. This oak tree species may live for hundreds of years. Zones 5-8. A small, round-crowned tree or clump shrub, sometimes forming thickets. It occasionally reaches 50 ft. but is usually no taller than 30 ft. Its deeply-lobed, deciduous leaves are bright green above and paler below, turning brown or sometimes red in fall. Often grows in dense groves or shrubby thickets. Zones 4-8. Beautiful, drought tolerant, medium size, deciduous shade tree. Height 25 to 35 feet, spread 15 to 20 feet. Lacey oak is a good scale for residential landscapes with blue-green mature foliage, peach colored new growth and similar fall color. Adapted to a wide range of soils throughout the South in zones 7 – 8. Large, fast growing evergreen shade tree. Shiny blue-green loquat- like leaves are lanceolate, up to 8” long sometimes deeply cut on the ends. Grows to 60 feet with a spread of 40 feet. New growth comes out in the spring before the old growth completely kicks off. Easy to grow shade tree for full sun with normal water and fertility requirements. It does need good drainage and should not be over-watered. Zones 7-10. Does well in acid as well as neutral to alkaline soils. Confusingly sold often as Monterrey oak, is evergreen most years, has leathery dark green distinctive foliage, is much cleaner than live oak and doesn’t get overpoweringly large. This is a beautiful and very tidy oak that is one of my favorites. Commonly called red oak or northern red oak, it is a medium sized, deciduous tree with a rounded to broad-spreading, often irregular crown. Typically grows at a moderate-to-fast rate to a height of 50-75' (often larger in the wild). Dark, lustrous green leaves (grayish-white beneath). Medium to large deciduous shade tree. Fall color is not spectacular. Small trees have a narrow pyramidal crown become broad, open and wide-spreading with age. Closely related to pin oak its leaf resembles that of red oak but is more deeply lobed and the acorns are larger and have a deeper cup. Only good in acid sandy soils in zones 6-9. Grows slowly, sometimes to more than 100 feet in height in its native habitat but is more often seen 30 to 40 feet high and wide, forming a rounded silhouette with an open crown, large-diameter branches and a twisted trunk. The dark green, leathery, lobed leaves have fuzzy, white undersides. Best in the acid soils of zones 6-9. Upright pyramidal shape with dominate straight central leader, especially when young, spreading with age, has red oak type leaves and usually a weeping nature, especially on the lower limbs. It has a stiff overall appearance. Will only grow in acid soils of zones 4-8. Rounded tree with stout, interestingly branched limbs with gnarly growth and thick, rounded lobed leaves. Fall color is less than spectacular – yellow to brown. Needs acid sandy soil in zones 5-9. Commonly called red oak or northern red oak, it is a medium sized, deciduous tree with a rounded to broad-spreading, often irregular crown. Typically grows at a moderate-to-fast rate to a height of 50-75' (often larger in the wild). Dark, lustrous green leaves (grayish-white beneath). 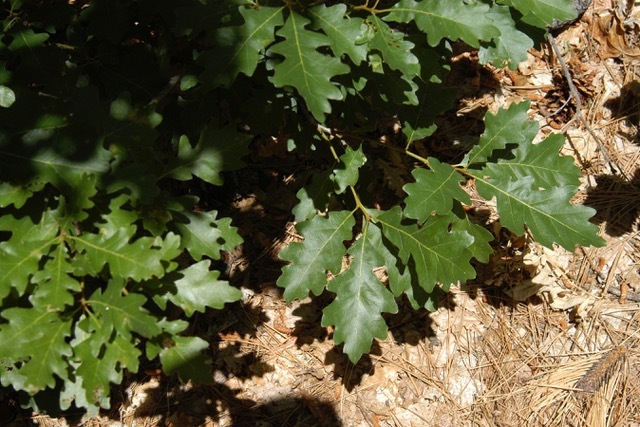 In general, there are many different kinds of red oaks and the most important species are listed separately and discussed in detail in the Library of dirtdoctor.com. Red oaks in general are large growing deciduous shade trees with beautiful foliage and good fall color. An upright growing deciduous tree native to Korea, China and Japan but will grow well in the south in the sandy soils that are neutral to acid pH and deep. Has a pyramidal form when young but becomes more rounded with maturity. Use in acid soils zones 4-8. Graceful tall growing and wide-spreading shade tree with beautiful fall color and lovely, deeply cut leaves. Fall color can range from yellowish- browns through yellows and reds to deep maroons. Native to the eastern U.S. Use in well drained soils in zones 6-9. Large-growing, graceful tree that has a rather open top, droopy leaves and so-so yellow fall color. It can only be successfully grown in the acid soils of the zones 6-9. Large growing medium-sized tree in the beech family. It is a common element of America's north central and northeastern mixed forests. It can survive in a variety of habitats and soils of zones 4-9. Also known as Buckley's oak, this species was named for Samuel B. Buckley, botanist and state geologist of Texas. Its leaves are similar to those of Q. texana, but the two species do not overlap in their native distributions. On the other hand, red oaks crossbreed so freely, it is hard to tell them apart. Zones 5-9. Large growing and spreading shade tree with leaves that are spoon-shaped and sometimes evergreen. Some trees will be completely deciduous and other almost totally evergreen. Weak fall color varies from yellow to brown. Needs neutral to acid soils of zones 6-9. Large, gorgeous tree with beautiful summer foliage and excellent red fall color. Best grown in rich, moist, acidic, well-drained loams in full sun. Adapts to a wide variety of soil conditions with good drought tolerance. Zones 3-9. Graceful, large growing tree that is pyramidal when young but spreading with a rounded crown with age. It has very narrow, delicate-looking leaves. Zones 5-9.